Not one, not two, but THREE books to be won. 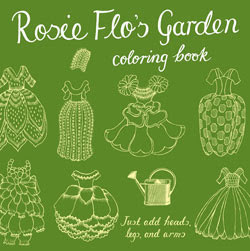 Copies of Rosie Flo's Coloring Book ; Rosie Flo's Garden Colouring Book ; and Rosie Flo's Animals Coloring Book have been donated by the publisher, Chronicle Books. Chronicle Books shows once again how to do a coloring book. The pages are thick; there will be no bleeding through of colors. The pages invite markers, paint, water colors, and why yes, even crayons. 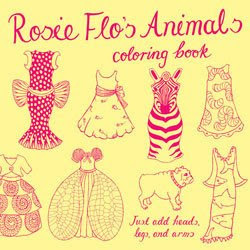 The Rosie Flo coloring books are the creation of English artist, Roz Streeten. 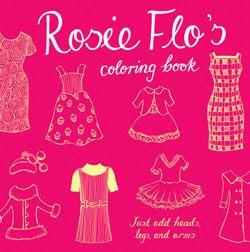 As she explains here, her daughters inspired this line of coloring books: "The Rosie Flo colouring books evolved through hours of sitting and drawing with my daughters when they were small. . . . Dresses were the most popular items demanded of me and Sophie (now 12) would then do the faces, arms and legs. . . . Sasha (now 8) became obsessed with simply colouring-in.... I was fascinated with how they both maintained such prolonged interest with this way of drawing and felt there must be other like minded girls around." All there books offer the best of both worlds, then; intricate dresses to be colored in, but blank space for the unlimited imagination of the young (or old) artist. Want to look inside? The publisher's website offers a "look inside" feature. OK, here are the rules. Sweet and simple. The contest runs until next Tuesday, April 28th. To enter, leave a comment about something coloring-book related. Your favorite coloring book; whether you HAD to stay within the lines or refused to make leaves green; your favorite Crayola crayon color; anything at all. I'll draw names at random, and announce the winners on Friday, May 1st. They have their own youtube video. When I was in fifth grade, the lengthy unit on colonial/revolutionary American history included a lot of coloring. We had packets of worksheets with questions about history and illustrations we had to color. I was a world-weary child and would have felt this was a stupid assignment in second grade, so I didn't bother doing the coloring the first time. When I got marked down, the next time I colored, fuming. Then I was marked down for using inaccurate colors for the clothing. I swear, there was no mention of what colors we could use previously, but anyway I chose the indigo crayon because I remembered indigo being mentioned in The Witch of Blackbird Pond. I mentioned this to my teacher and did not win any points, actual or metaphorical. I grew up in Bethlehem, PA - very close to the Crayola Factory. When I visited with my parents, I remember thinking I wanted to take a swim in a mixture of multifarious crayola crayon shavings. I still dream about it sometimes, but in my dreams, the shavings are edible! My favorite part of coloring books were the white inside covers that I could draw on! I loved making darker lines for an outline and then coloring in the inside of that very lightly. It made for a more striking effect! Both my parents prided themselves on their coloring skills, and I vividly remember a bitter argument one night when I was eight or so about whether my mother's picture of Peter Rabbit was better than the one of Jeremy Fisher my father had colored. My favorite things to color were the princesses my mother drew for me. I didn't much like coloring books as a kid (find them rather soothing now, though), although I did appreciate my dad's tip of coloring in an area lightly with one color (dark blue, say), and then coloring over it lightly with another color (maybe light blue or yellow). Tres sophisticated results that wowed the whole class! I loved coloring books when I was growing up (and even after I was grown up). I had the whole 98 crayola set & arranged them by color, testing them to make sure what color they actually were since sometimes the wrapper does not represent exactly. It was never a good day when the box tipped over and they all fell out. Oh, my gosh! - Liz, are these British? (Noted the weird 'u' in coloring.) I shall look for them -- I just had a friend over in our severely under-furnitured student flat, and we lay on the floor, unrolled a piece of paper from packing, and went to town with markers, watercolor pencils, stamps, and crayons. I used to draw headless dressed torsos for my sister in church, too. She would LOVE this, even at 13. I'm not in the running for the contest, being in Scotland, but I'm definitely going to try and find these! Oh, Coloring! I still color. Especially when I get stressed out. I'm 31. People often look at me funny when I do this in public, say at a restaurant that offers coloring pages and a plastic wrapped primary color crayon package. But I love filling in what another person has so carefully structured for me. I've taught high school for years and directed student productions- usually I am the one having to create a structure within which others can shine. Coloring is meditative and yet, when you are done, you actually have something tangible and beautiful to show for your time. I still cannot color in the lines and I'm 30 years old. Yes, I'm expecting you to mock me now. When I was about 10 years old, my best friend and I made our own coloring books by neatly ripping our our favorite pages from other coloring books. We each had about 100 pages. Then we grew tired of coloring before we finished and moved on to our next obsession. Small daughter (age 4) and I spend quite a lot of our time coloring these days! Those Rosie Flo books remind me of the paper doll clothes I used to draw when I was daughter's age (for Tubby and Lulu!). Did you ever step on a crayon on a tile floor in the middle of the night when going to the kitchen to get a sick child a cup of ice water? My kids are lucky that I haven't thrown the whole lot of them out yet. Nonetheless, we have hundreds - possibly every color Crayola has made in the last 9 years. love to color with my daughter - very relaxing - and I don't even care if I stay in the lines! And I just loved the name of the crayloa crayon - Burnt Sienna - although the color looks a little like baby poo - LOL! I was the oldest of three children, and a very mean older sister was I. I convinced my sister and brother that when you coloured with textas, they were magic. You should colour recklessly, not worrying if you went out of the lines, because when you closed the book and left it for a while, it would magically turn into the most perfect colouring ever, looking just like a coloured book illustration. When I think of coloring books, I think of my cousin, who moved to the US from Romania (and married into the family.) She's a riot, and her English is a delight to the cochlea. She visits family every so often, and on her trans-Atlantic flights, colors for eight solid hours. She raises one eyebrow when she tells this story, shrugging both shoulders. "I look up and say what?! We're here already? They proobably tink I'm like a little girl, but I don't care. I love to color!"